DEI Boom Mat Under Hood Thermal Acoustic Lining UNIVERSAL - Pann Auto Performance - San Diego largest aftermarket automotive performance parts - What do you drive? Made of 3/4” thick, high quality, industrial acoustical grade foam with a reinforced reflective aluminum covering, Under Hood Thermal Acoustic Lining not only insulates the underside of hoods but serves as a sound deadener and thermal control while protecting paint finishes. 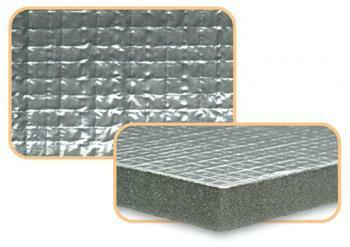 Under Hood Thermal Acoustic Lining can also be used as noise control applications such as on generator boxes and many industrial uses including HVAC applications.